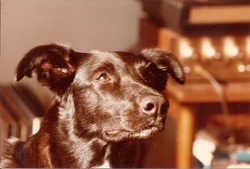 How's Ruff n' Reddy - "Ruff"
Ruff was Barb's first dog. 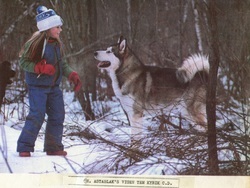 In Feb of '84 we decided to add an Alaskan Malamute to our family. Little did we know what it would eventually lead to! Astablak's Imbri de Chabek - "Imbri"
When Imbri joined us we left the city and found a home in the country. She ran in the team. Ch. 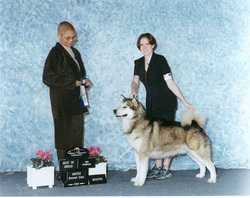 Samovar's Mint Condition CD - "Minty"
Minty was trained and shown by owner Jennifer. 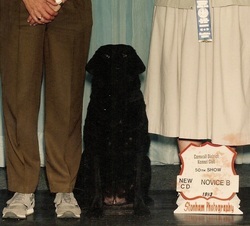 At their first show, they beat a special for the breed and then got the puppy group. Minty ran in team and lead. 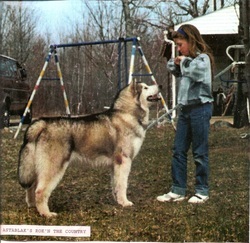 Astablak's Rok'n The Country - "Rok"
Jennifer trying to teach Rok to bait when he was about 8 months old. He was a powerful wheel dog. 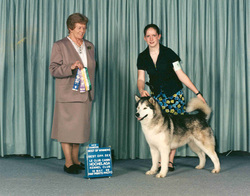 Astablak's Zelda de Chabek CD - "Zelda"
Zelda was trained and shown by owner Natalie. Here they got Winners Female at a booster and 2nd in Novice A on the same day! 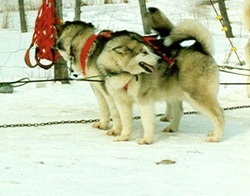 Astablak's Tika Taaka Toa - "Tika"
Tika was a good wheel dog' She is on the right, her uncle Rok is on the left. 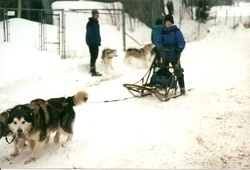 Astablak's Traveller Over Ice - "Travis"
A great wheel dog, he was about 8 weeks old in this photo. 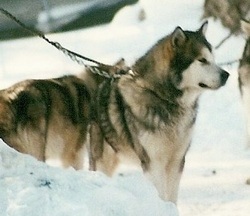 Astablak's Badgio de Chabek - "Badge"
After he retired he went to live with friends in downtown Ottawa where he became a great ambassador for the breed. Ch. Astablak's Good Knight Sorcia - "Sorcia"
Kimlan's Keen to Run - "Keenu"
Astablak's Reign of El Nino - "Elly"
Ran doube lead with Bayer, she is just one year old in this photo. Ch. 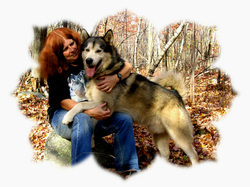 Astablak's Inigo - "Inigo"
Inigo finished in one weekend, taking a BOB over 24 Malamutes. 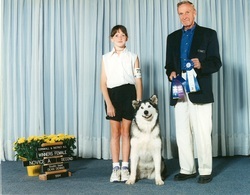 Mark joined us in 2001, he was a great team dog and occasionally ran lead. Lego was an incredible wheel dog. His work ethic will be greatly missed on the team. 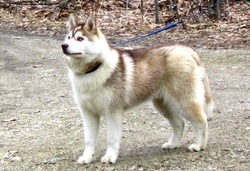 Astablak's Resounding Alaska - "Reese"
Kimlan's Astablak Serendipity WLD - "Sera"
Sera runs single or double lead and has qualified for her Working Lead Dog certificate. When Wayne first met Barb, to his delight, she came with a young Lab mix. Smokey was the start of our life together with dogs. Ch. 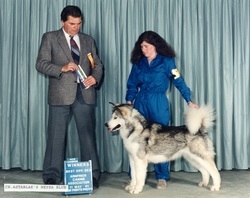 Astablak's Vigen Tem Kyrik CD - "Kyrik"
Pictured here with Jennifer, Kyrik was our first home bred Champion. 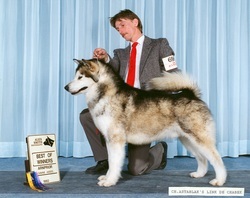 A great lead dog. 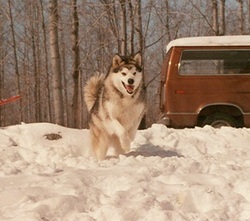 Chuba came to live with us in the summer of 1990. Keeley's Noel de Chabek - "Noel"
Noel joined us in Dec of 88 and ran in the team. Ch. Astablak's Neysa Blue - "Neysa"
Labradales Trix'n'Trills CD - "Trix"
It is very hard to get a good photo of a black dog. 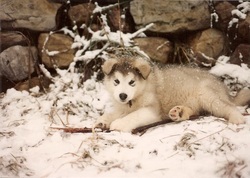 Trix ran on the sled team sometimes but prefered to stay home. When she was young, she loved to tease the dogs. 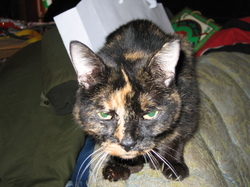 She lived with us for 18 years. Ch. Astablak's Link de Chabek - "Link"
Astablak's J.J. Outa the Blue - "JJ"
JJ ran in lead, but got distracted by things like birds flying by. Seen here with his mom, learning to lead. Ch. Astablak's Vandamet de Chabek - "Vanda"
A hard working team dog and very talkative. 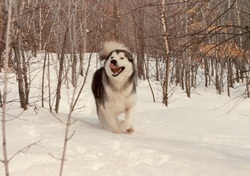 Astablak's Anya Wanna Run - "Anya"
Ch. 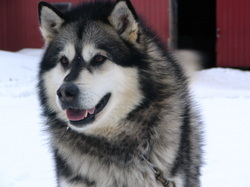 Astablak's Kayak Overdrive - "Kya"
Astablak's Bay-er Naked Run - "Bayer"
Ch Astablak's Cub Scout - "Scout"
Astablak's Tickle Me Elmo - "Elmo"
Kimlan's Solar Chimes - "Chime"
Chime loved to sled and usually ran point. Kimlan's Ginger Snap - "Snap"
​A sweet girl who loved to run and never caused problems. Kimlan's Arctic Mist Er "Mister"
Don't bug me, I'm resting! PC wandered in as a tiny kitten and decided to stay.